Danish Army Specific: VW M111, better known as the "Beetle", became part of the inventory of the Danish Army in 1957. Historical: The development of the Beetle took place from 1934 - 1938 by Dr. Ferdinand Porsche. He submitted a paper describing the construction of a "German Peoples Car" to the Reich Transport Ministry in January 1934. In March 1934 Dr. Porsche was issued a brief by the Reichsverband der Automobil-Industrie to design the car. The "Typ 30" prototypes first appeared in public in 1936, when they were tested by the SS-Fahrbereitschaft. As manufacturers companies as Adler, Auto-Union, Daimler-Benz and Opel were mentioned. Actually Daimler-Benz delivered 2 bodies for early prototypes, and later produced 30 prototypes. To save time, the engine was based on an air-cooled unit Porsche had developed for NSU. The vehicle appeared in its final form in 1938, and at this time the construction phase came under state control. The VW factory, which was made to produce the Beetle, was founded near Fallersleben north-east of Hannover in 1938 - the town of Wolfsburg did not exist at this time. A selection of VW´s were shown to the public at the Berlin Auto Show in February 1939, and production were scheduled to begin in September same year. 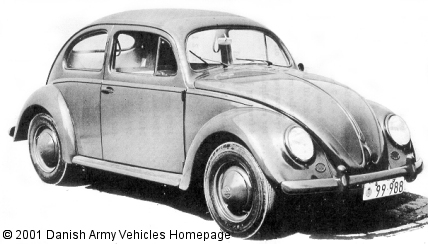 In 1940 the factory started deliverance of the "Kubelwagen", based on the beetle of which no production has taken place so far, to the German Wehrmacht. 2 years later the "Schwimmwagen", a amphibious car with 4-wheel drive, went into production. A beetle with 4-wheel drive, known as the "Kommandeurwagen", was also produced. At the end of WW II, around 70.000 of all models had been produced. Production of the Beetle commenced in 1945, with the company under British supervision, and the 25.000th vehicle was made in May 1948. In 1955 the 1 million marks was reached. The last German build "Beetle" was made on the 19th of January 1978, but production carried on in Mexico. In total more than 21 millions has been produced. VW designation for shown model was "VW Käfer 1200, type 111 Standard". Length: 4.07 m (158 inches). Height: 1.50 m (58 inches). Weight: 1.150 kg (2.530 lb.). Engine: 4-cylinder boxer, 1.192 cm3 (73 cubic inches) displacement, air cooled. Horsepower: 30 at 3.400 rpm. Range: 250 km (156 miles). Additional: Latest delivered cars (model 113) had a 1.3 liter engine. Acquisition price in 1974 was around 14.000,- DKr.